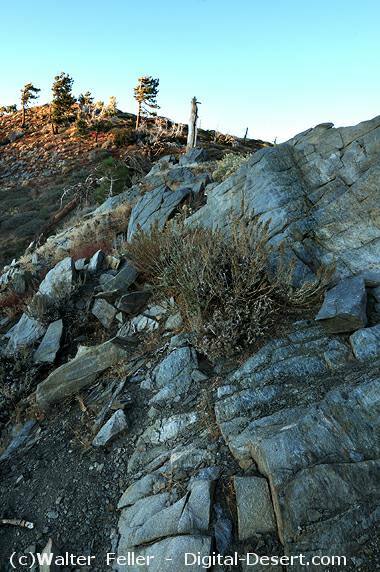 Blue Ridge Summit (7,360') is where the Angeles Crest Highway, SR2, gains its highest elevation while crossing the Blue Ridge. At the summit, on the north side of the road, is a large trailhead parking lot for the Pacific Crest Trail complete with restrooms. Also on the north side is a nature trail circling Lightning Ridge with an incredible display of wildflowers for much of the year. To the southwest is Inspiration Point, a not-to-be-missed vista overlooking the East Fork of the San Gabriel River, Mt. Baldy and Mt. Baden-Powell. (See calculated elevation angles and azimuthal angles to visible features from Lightning Ridge.) To the southeast is an electronic site and the Blue Ridge Road, the access for hiking Wright / Pine / Dawson / Baldy Mtns., the northern Devil's Backbone Trail. By Car: East from Big Pines, 1.7 miles, on Angeles Crest Highway, SR2. East from the Blue Ridge Fire Road. By Trail: On the Pacific Crest Trail west from Grassy Hollow and east from Wrightwood. North from a trail around Lightning Ridge. Season: Snow closure in winter.